"As a mom, it is challenging to carve out time to focus on your own wellbeing and health. Healthy Mamma is about encouraging mothers to prioritize their physical and mental wellbeing, by accomplishing one small health challenge a day. One daily WhatsApp. One daily health goal. Your baby deserves the best care. So does your body. Start your wellness journey TODAY. Join Healthy Mamma"
Membership is $20 per month & you can sign up for 1 month or 1 year! I think the price is very good, given the fact that you have daily contact from a qualified professional. The company itself is based in Dubai & Cape Town (South Africa) but the clients are worldwide & the program is achievable from wherever you may live. 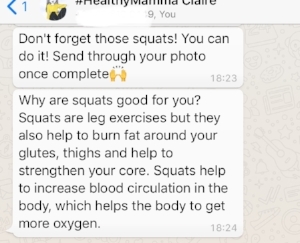 You will receive 1 'whatsapp message' each morning, which is short, easy to follow & most certainly achievable - below I have screen-shot examples from the 7 day trial I did. The program is interactive, so you can feel free to ask any questions if you are not sure about the task, and you must send a picture back to 'complete a task'. See how fun & achievable the messages are? You are inspired to do something small, every day to make sure that you give yourself a little time - remembering to take care of YOU, in between caring for your family, job, or whatever you have going on in your life. Sometime's we forget that taking care of US, is key to being the best we can be for others. *Healthy Mamma health & wellness programme has been created with input and approval from experts trained in physiology, health and nutrition. *Our Mummy Life was offered a 7 day free trial in exchange for a write up & honest review. The view expressed in this article are my own, and of course honest. Thank you for taking the time to read this, if you have any questions feel free to leave a comment below - I would love to hear from you!